Tsubaki of Canada’s asphalt chains are engineered to withstand the demands of the paving season. Hard aggregates, shock loads, intense heat and almost around-the-clock operation means every component in your operation must perform exceptionally. 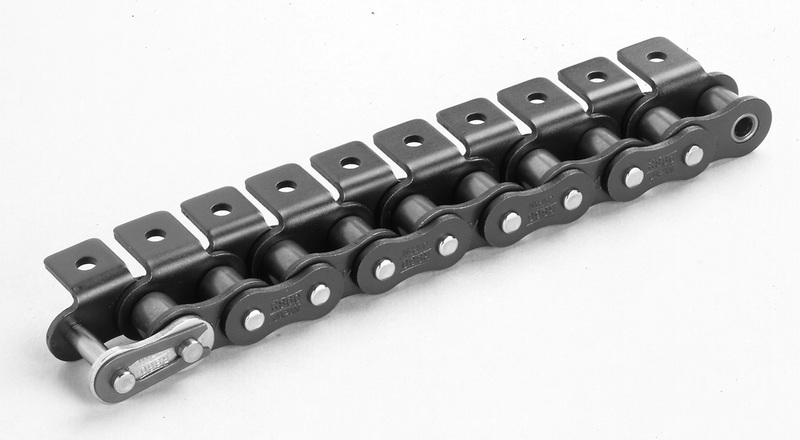 Tsubaki’s asphalt chain was built to offer critical benefits such as tight press fit, increase strength, precise pitch control, and longer service life. We can supply incline conveyor asphalt chains with 4 inch or 6 inch pitch and with K-style or slotted M-style attachments. 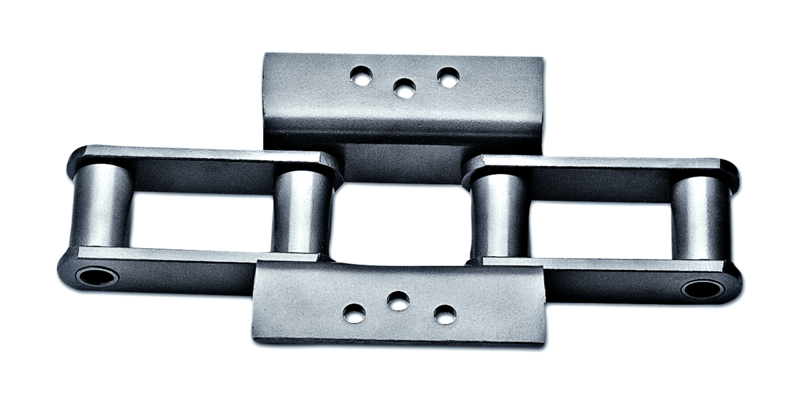 To provide maximum strength and longevity, sidebars are through-hardened to withstand high impact loads and rollers are especially heat treated to resist abrasion. Tsubaki of Canada is the manufacturer to trust in the fabrication of asphalt incline conveyor sprockets and related parts. To construct our sprockets, we utilize finest materials, heat treatment, design, and manufacturing processes. Tsubaki’s unified sprockets enable easy replacement of worn portion. Segmental rim style sprockets are available and made from high quality 1045 steel with minimum 50 HRC tooth hardness to withstand extreme abrasion. The hub body is a solid construction to ensure strength in operation. It’s easily mountable to stand shafting and is available in split style for easy replacement. Our return support rollers support the weight of the chain on the conveyor return side with rollers machined to the chain’s exact profile. We also provide scraper flights fabricated and assembled at our factory. To eliminate guesswork associated with worn sprockets, add Smart Tooth to your asphalt sprockets. Tsubaki Smart Tooth helps extend chain life through predictable maintenance. Strategic placement of our patented Wear Indicator pins on one or more sprocket teeth provides visual indication that a sprocket is within the allowable wear tolerance, or that it needs to be replaced. To complete the solution provided by Tsubaki, we offer our pre-fabricated one-touch steel doors that seal out dust and rain but permit inspections by simply lifting the handle with no bolts to loosen or cover to misplace. In addition, to prevent damage to machinery and other expensive equipment, we offerback stop cam clutch that helps prevent reverse rotation of drive shaft. With the outer race of the clutch anchored stationary, the inner race can overrun freely in one direction of rotation. Reverse rotation is instantaneously prevented by the automatic engagement of the clutch. For any asphalt needs, trust Tsubaki! 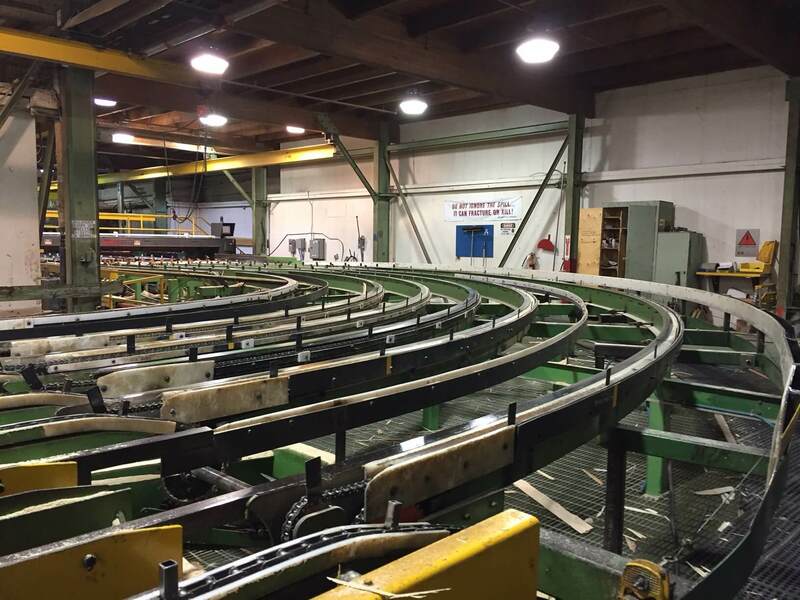 A transfer conveyor conveying rough cut lumber on a 90⁰ angle. This customer was using a standard Tsubaki 80 curved chain, however, was experiencing premature elongation due to lack of lubrication and over-tensioning. Worn sprockets were further interfering with optimal performance. Replaced standard 80 curved chain with size 80 Lambda curved chain. Lambda chain is a self-lubricating chain that’s using oil-impregnated sintered bushings to keep pin-bushing engaged area lubricated. Lambda can last up to 14 times the wear elongation life than that of non-lubricated ANSI standard roller chain and is ideal for applications where manual lubrication can be tricky. We also recommended the customer to replace worn sprockets with new Tsubaki sprockets. Replacing worn sprockets in a timely manner is essential to avoid expensive downtime due to performance failure. When sprockets are not changed together with the chain it can lead to as much as 25% reduction in chain life for each additional installation on the same sprocket. The previous chain the customer was using lasted for 2 years. When the chain was replaced with Lambda and the old sprockets were changed out for new ones, the life of the chain increased to 6.5 years and counting. After adopting Tsubaki’s solution, this customer benefited from prolonged wear life, maximized chain performance, and cost savings of $52,733.14 and counting. How to Minimize Mechanical Wear on Chains? Chain wear happens due to pins and bushings rubbing against each other every time the chain links engage and rotate with the sprocket. Over time, this chain and sprocket interaction reduces the pin’s outer diameter and increases the bushing’s inner diameter. Eventually, causing the relative pitch of the chain to increase and resulting into chain elongation. Ensure that every chain is the right size for its application. If a chain is sized, installed, and maintained properly, you should get about 15,000 operating hours before it reaches elongation limit. Ensure that sprocket faces are aligned, and shafts are parallel. Maintain sufficient slack on the chain’s non-tension side. Clean the chain often to allow lubrication to get into the pin-bushing bearing area. Lubricate the chain with suitable oil. Rely on the horsepower rating and Tsubaki’s recommended viscosity tables to choose the right oil. Proper lubrication is vital to prolonging chain life. Applications where manual lubrication is not feasible, try Tsubaki’s Lambda self-lubricating chain. Lambda uses oil-impregnated sintered metal bushings to keep pin-bushing bearing area lubricated. Lambda lasts 7 to 14 times longer than non-lubricated chains. With proper care and maintenance, users can extend the life of Tsubaki chains to the maximum possible.